While reading through my Living Without magazine (which I highly recommend! 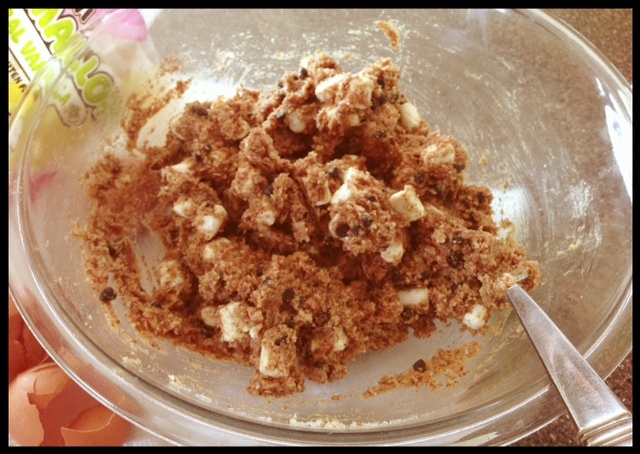 ), I stumbled upon a recipe for GF S’more cookies. Since I last talked about preparing food, I’m not sure I mentioned, my oldest daughter asked to go grain free (yes, on her own!) about 3 weeks ago. She was one of my kids that had digestive issues and rashes from gluten, but because her issues have gone on since she was a baby, I’m sure her celiac/food sensitivities has taken on a mind of it’s own ( Watch: The top 5 things you didn’t know about gluten, and why it takes on a mind of it’s own! )…struggling with additional proteins in any grains. When you’re dealing with kids though, you can plant seeds – but it’s much easier to implement changes from gluten-free, to grain-free if THEY are on board. Well, she has been completely on board and doing awesome – and I’m very proud of her for making this choice and sticking with it. She did ask me after the first week if she could never have gluten-free grains again… And I just explained to her that life is about choices. Sometimes we have to turn our backs to things that are not a good fit for us. That seemed to encourage her that she would be “Just fine” without grains. So back to me implementing meals and treats, and things that include making sure she has something to eat and enjoy also. This isn’t too far of a stretch for me, since I try to have our family eat Paleo mostly, I just didn’t announce it, for them to buck the system. They really don’t complain about anything – and baking goods, are baked goods – so they don’t get too upset about nut flours – ever. 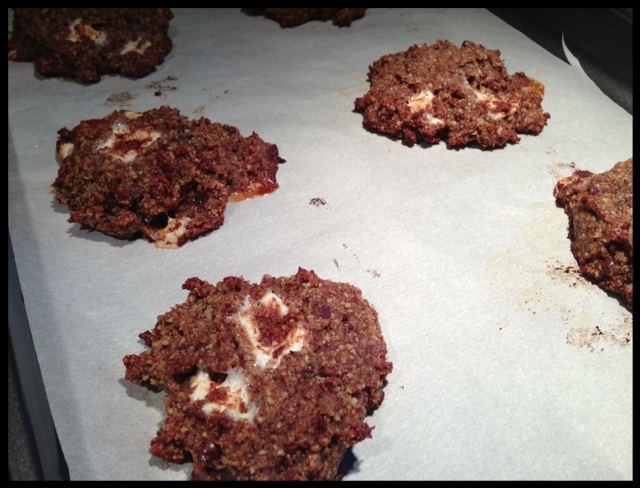 Back to the cookies, I decided to revise the recipe to make it gluten-free, dairy-free and grain-free so that all of the kids could enjoy them. Because it’s difficult to tell your children they can’t have something everyone else is having!! IT feels good to say – you can ALL have this! ** now the recipe calls for refrigerating the dough over night and using cold to bake. I didn’t do that. *impatient? Preheat oven to 250 degrees and bake 12-14 minutes. Just in case you’re wondering. NO. I can’t eat these. It’s the nut flour, and the sugars, and the chocolate – it doesn’t jive with my auto immune disease protocol diet. (most any baked thing doesn’t). BUT… I am excited to try out something from my cookbook for auto immune disease… that I just got last week! I’ll keep you posted if any of the dishes sit well with me! God bless your new week -it’s a busy one here full of celebration – a birthday, an anniversary, and a wedding! Can’t wait to see what God has planned! Posted on June 9, 2013, in Auto Immune Disease, Celiac/Gluten Sensitivity, Food To Try, Truth and tagged auto immune disease cookies, celiac disease, healthy for him, MS, Paleo S'more cookies, smore gluten free cookies. Bookmark the permalink. Leave a comment.